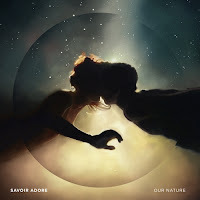 Savoir Adore kicked off their musical career with one rule, straight-forward enough - in recording their debut EP, they decided to place a 48-hour deadline on its completion, and furthermore, resolved that there’d be no acoustic guitar in the mix. A challenge to foster creativity? Perhaps. If creativity wasn't a part of the group's humble beginning, though, it's certainly a part of the formula in 2012. What we have here is an album with delectable indie songs, traditional in structure but unique in terms of styling. “Dreamers,” for instance, reveres the dance hooks of the ‘80s by channeling them into a distinctly modern energy. And overall, Our Nature gives the impression of having been around the block and back - the album treads a surprising amount of indie-pop ground, each new interpretation of the genre much more of a success than anyone expected it to be. Savoir Adore know exactly what they’re doing on Our Nature. Every moment’s perfectly calculated, down to the finest details. “Empire of Light,” a late-game bombshell, is the most immediately gripping track here mostly because of its intricate arrangement, sanguine bassline moving on alongside cloudy synth landscapes. Paul Hammer and Deidre Muro deserve recognition for their stellar vocalplay on this track, as well as across the whole album, because their natural ability to write memorable vocal hooks is one of the most alluring qualities of Our Nature. There are many other highlights, though - the clear-cut production, the lush soundscapes carved sensitively, and the varietal instrumentation in play throughout the whole album. Our Nature begins similarly to a more immediate and confident Stars album, and quickly enough the album fades away with “Sea of Gold,” sentimental but in a more reserved manner. Regardless of the subtle mood change, though, Our Nature is startlingly cohesive throughout its runtime, one reticent tune dying to evolve into the jubilant anthem bound to come after. Variety and quality haven’t ever quite been this hand-in-hand, especially in the indie-pop realm where artists are busy experimenting with texture palettes, one after the other. Instead, it all comes together freely here, the individual pieces hugging each other to create a patchwork of promise more sprawling than they ever imagined to be possible. Despite the best of the average artist’s intentions, he often struggles to create harmony within his material. Forced themes can overshadow the true lasting capability of an otherwise excellent aesthetic object, just like art that tries too hard can be too hard to swallow. However, occasionally both sides of the scale balance perfectly, in impeccable harmony, and it’s during these moments that we remember it comes easier to some artists than to others. Savoir Adore are best suited for exploring the recesses of indie-pop, noting what’s worked most successfully in the genre’s past and utilizing it to shade their brand of music as they please. Here’s to the group blowing away expectations, as well as to a long and prosperous future. Savoir Adore will continue to raise the bar higher and higher with each forthcoming release, and we’ll be there to witness it all.